It was definitely a yard not a garden when we bought the house (above – May 2005). All that grass! May 2006. The grass is gone and the baby plants are in place. But look at the HUGE ALUMINUM mail box. I don’t think we could have found a bigger one if we tried. 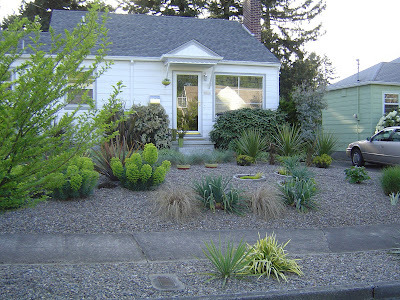 Another one of those ideas that seemed like a good one at the time, the concrete planting circles (above and below). 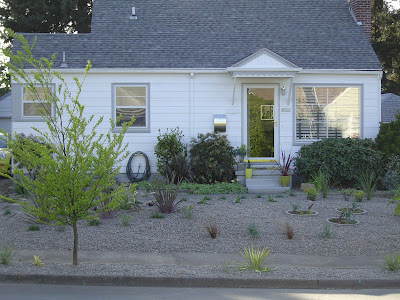 I desperately wanted to pour round concrete planters of various heights around the front garden. I still love the idea and think it would be fabulous! However the reality of budget stepped in and squashed my vision. In a misguided attempt to cheaply replicate the idea I purchased those round scalloped circles that come in 3 sections and buried the scalloped edge in the ground. 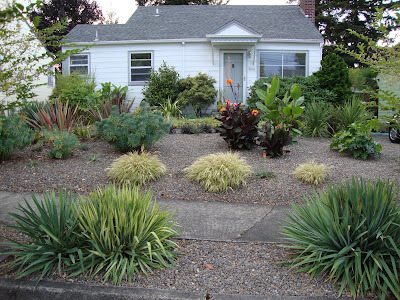 The circles contained Canna lilies and Kniphofia. I grew to hate the circles. And early this September 2009, on a sunny day, notice the planting circles are gone! I got rid of those earlier in the spring. Good riddance! September 2009, on a cloudy day. I’ve removed the eye-sore buried terra-cotta pots (in the center of the above picture) and torn out the huge Miscanthus in the far right corner. Here’s a little teaser picture of what you don’t see above, and why I tore out the floppy misbehaving Miscanthus …Tetrapanax! 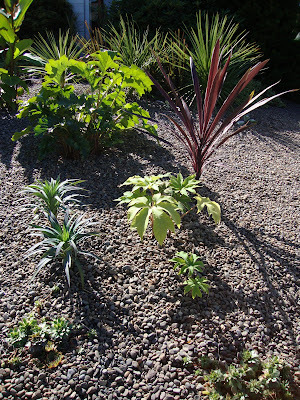 I planted a new grouping in the corner of the garden with Tetrapanax, Yucca A. Purpurea from Tsugawa, and a borderline hardy purple Cordyline (which I promise not to cry about if it doesn’t make it through the winter). I can’t wait to have passers bye stopping to stare at the Tetrapanax next year! Love the transition of your home to a gardened place. Look at the baby plants way back when! I love the progression of a garden. It's one of my favorite things about this whole business of taking pictures of the garden - knowing that one day I'll be able to look back and see how different everything looks. I can't wait to see your new tetrapanax next year in all it's hugeness. More marvelous changes over the years. I like that poured-concrete circle idea too, Loree. I've actually seen it done with differing heights of stock tanks! I'm wondering--do you have a path from the street to the front door, or do you get there from the driveway? Your neighbors must be thrilled. Are they following your lead? 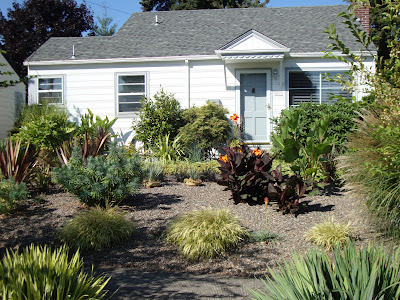 The house itself looks better and better as the garden matures. Talk about raising property value! DG~~ And as you know, your teensy little Tetrapanax, [not all that small really] will morph into a giant in no time. What a sight that will be. It looks like your phormiums made it through last winter. My 'Sundowner' was a real downer after that crud. This year if cold threatens I'm putting a bucket over it. ... I dug out my Miscanthus too. I love them but they grow too fast and get too big. They need a huge space to look their best. And digging them is no small feat either. Ilona, well put! I love the way you said that! Megan, isn't it fun? I wish I hadn't lost a whole year of pictures though (2008) because that was when it was looking REALLY good. Before winter 2008/9 knocked everything back a couple of notches. Pam, no path from the street but there is a smaller sidewalk from the driveway, actually it is odd but none of the houses in our neighborhood connect to the main sidewalk/street they are all entered via the driveway. ricki, actually the one thing that almost kept me from doing this series of posts was looking at the house. It's ugly! I wanted a ranch style home but when we were house hunting every single one we saw was on a corner lot with no backyard at all...not acceptable! 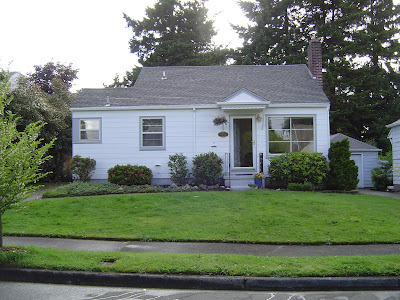 Someone once told me that I actually lowered the property value by tearing out the grass. I so don't care! And unfortunately the neighbors are not gardeners, except one...and he has a fabulous palm!